Three Vikings set out on a daring quest in this thoughtful picture book that shines a light on teamwork and individuality by Ezra Jack Keats Honor-winning creator Adam Auerbach. Three Vikings were dreaming of Valhalla: an enchanted land full of possibility where only the strongest and bravest can enter. The littlest Viking is neither the strongest nor the bravest, though he is the most creative. Can a gentle, musical Viking really survive the treacherous road to Valhalla? This mythical tale celebrates teamwork, acceptance, the power of music, and the art of storytelling. 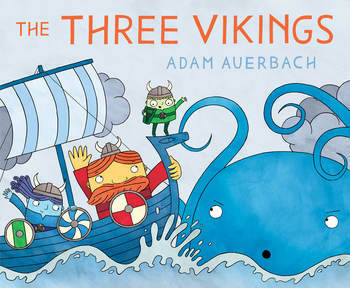 ADAM AUERBACH is the creator of Edda: A Little Valkyrie's First Day of School, which was named an Ezra Jack Keats Honor Book. Adam's illustrations have appeared on book covers and in numerous print publications, including the New York Times and School Library Journal. He lives with his family in Brooklyn, New York.